ItsOKtobeYOU.org - Your Kristen Stewart Fansite & Source: 'Café Society' U.S. release date has been moved forward - to July 15! 'Café Society' U.S. release date has been moved forward - to July 15! How cool, now both 'Café Society' and 'Equals' open in limited release on July 15 in the U.S! Enjoyyyyyyy. Lionsgate will release CAFÉ SOCIETY in limited release on July 15, 2016 and will expand the film into wide release on July 29. Amazon did the same tonight with a first clip of Jesse as Bobby! They also announced that they're going to team up with Lionsgate to release it nationwide in the US in August - and the NY Post Film Editor tweeted that the movie will be released in New York on July 15! • Deadline: We mentioned in our report on Amazon Studios’ CinemaCon lunch that Lionsgate is releasing the online retailer studio’s Woody Allen film Cafe Society in August. But now Deadline has learned is that the all-star film — which will open the Cannes Film Festival next month — is going wide on August 12, making it the filmmaker’s first wide release since 2003’s Anything Else. • THR: Just hours after learning that five of its films will play the Cannes Film Festival, Roy Price's Amazon Studios revealed in Las Vegas that the streaming service is teaming with Lionsgate to release Woody Allen's Cafe Society — which opens the festival — in theaters in August. "A good robust theatrical run is good for everyone," Price told the crowd, prompting several rounds of applause. "Therefore, almost all of our films will have full theatrical releases. Our goals are aligned with exhibition." Amazon Studios marketing Bob Berney led the lunch presentation. 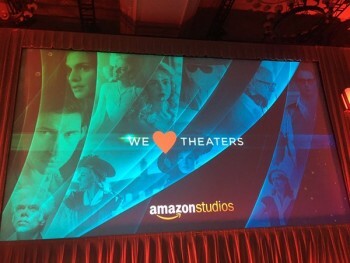 It's a coup that Amazon was part of the official program at CinemaCon, considering many exhibitors have been leery about Netflix and Amazon's move into the original movie business. However, Amazon has quickly decided that it's better for their films to play first in theaters and honor the 90-day window before making them available to Amazon Prime customers. Otherwise, most theaters will refuse to play the movies at all.